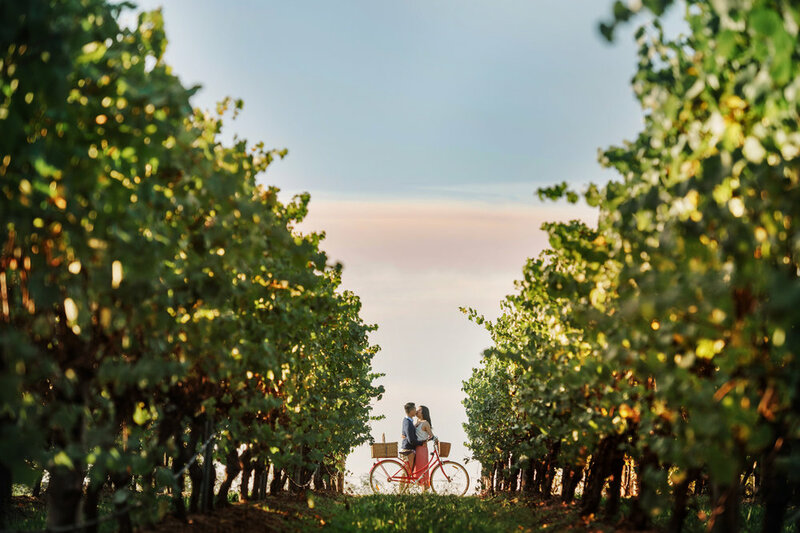 Are you getting married at a vineyard near Melbourne? Are you fun loving and affectionate, happy to be involved in a creative process, experiment with photography and go with the flow? I'm looking for new couples who are having a vineyard wedding near Melbourne and want some unique engagement photos at their future wedding venue. This offer is good for only 5 couples and the engagement sessions are totally free! Yes, seriously... free. I'll even give you a beautiful print from the shoot. Yes, you will have the opportunity to purchase more photos after the shoot, but that's entirely up to you. Why? I'm trying to expand my portfolio, and while I've captured many beautiful vineyard weddings around Melbourne, there are so many venues I still haven't had the chance to photograph at. I also love experimenting and finding new photographic ideas at venues I've photographed before, and without the pressure and time-restraints of a wedding day, engagement shoots are the perfect opportunity for this. If all this sounds exciting to you and your partner, fill out the contact form below, give me some details and we'll speak soon.